Watch your fabric and quilts come to life using colored pencils. You will learn the technique to color and shade your fabric or quilted piece to give it a 3-dimensional look. We will use a special medium to permanently set your color. Each student can choose the pattern you want to work on in class. Crabapple Hill has a great variety of patterns that work well. Once you have painted your design, you can then hand embroider around the design to really add dimension and depth. Or not; these can also be stand-alone pieces on their own. About the teacher: Catherine is an artist at heart and has practiced her skills for many years. 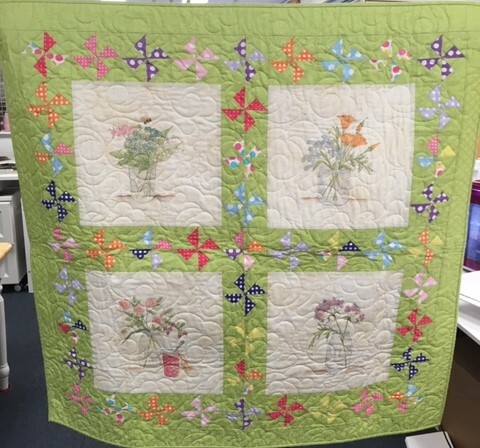 She discovered the joys of quilting in her friend's quilt shop. It was a natural progression for her to combine her art with quilting. In 2008 she began teaching to share her skills with others. In 2015, Catherine was honored to have a challenge quilt published in Quilting Arts Magazine. We are delighted to have Catherine join our teaching staff and are sure you will enjoy learning from her. Time: 12 noon - 3 p.m.